People need to be informed about red fox domestication. When people feed the red foxes, they are injuring the ecosystem. They are injuring the ecosystem because red foxes are no longer hunting for themselves and teaching their pups to hunt, and this makes the foxes a danger to humans. Ranger Jon Nicholson stated that the main issue with red foxes in Yellowstone park was competition with other canines affecting their population. When visitors enter the park they receive and informational book that mentions the red fox population, it states that the foxes are indeed always competing with the other canines but it states that the population is increasing ever since the wolves were reintroduced into the park. 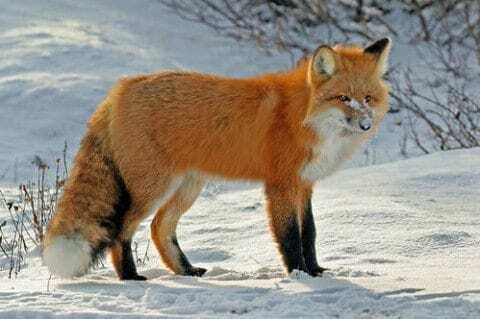 The Yellowstone website stated that there is a problem with competition among other canines but the population is increasing and that the most drastic issue with red foxes is domestication. When red foxes are fed in the park the rangers will remove the fox from the area to prevent the fox from domestication and not hunting on its own anymore. After they are relocated some will stay where they are and continue to live their lives however some will return and proceed to be removed and relocated until they will be put down for domestication. Not only is fox domestication an issue from just feeding the animal but also interacting with them. Timothy Treadwell, also known as “grizzly man”, has video footage of him coming into contact with a red fox he named “ghost.” The red fox approached Treadwell in hope for getting food, and also brought along her pups to get fed as well. One of the fox pups took Mr. Treadwell’s hat and ran off with it and ended up being scowled by Timothy as if the animal should have known better. The problem with red fox domestication is that tourists and visitors are unaware of the impact they have on the ecosystem. They enter the park expecting and believing it to be a petting zoo instead of being aware of the fact that they are in a wild environment. I visited Yellowstone Park with my class to extend our research and gather personal evidence. I however did not have the chance to see any red foxes during the trip but I did see other signs of animal domestication. We had a presentation from Dr. Shane Doyle at Sheepeater Cliff, during the amazing presentation a curious rock chuck approached him. There was an obvious sign of domestication as the animal came within two feet of Mr. Doyle. The most impacting part of this experience was the fact that we were extremely far from any source of civilization, in other words we were deep in the forest. Not only were there signs of wild animals being fed but also attempted to be picked up. When we were at one of the board walks near the geysers I walked by a collage couple who spotted a chipmunk near by. The man told the woman to “pick it up” and the lady bent down and reached her hand toward the animal, frightening it and making it run away. There is an issue in the park on how poorly the tourists are absorbing the information about red fox and wildlife domestication. Tourists see red foxes and assume that they can’t be violent and that it won’t affect them if they feed the foxes. The foxes are being put down from the uninformed and reckless behavior of park visitors. People need to be informed about the red fox domestication because they are injuring the ecosystem and making the foxes a danger to humans. Yellowstone National Park: Red Foxes by Kaleigh is licensed under a Creative Commons Attribution-ShareAlike 4.0 International License.